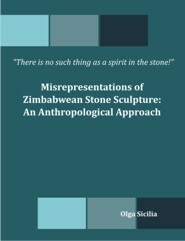 This work focuses on contemporary Zimbabwean Stone Sculpture - widely known until the early 1990s as "Shona Sculpture" - from the perspective of a critical anthropological analysis of cultural identity and representation. The analysis frames the inception of this art movement within the colonial socio-historical circumstances of its genesis, where discourse about the producers of this art form ("Shona discourse") was created. Drawing from the social context of inequality and racial (spatial) segregation, and from the concepts of the "primitive" in art and anthropology, the author aims to show how "Shona discourse" entails a primitivist construction of the Other (i.e., the sculptors' cultural identity) that is directly linked to modernist primitivism. "Shona discourse," as a temporalising discourse, situates the producers of so-called "Shona sculpture" in an extra-ordinary time, the time of "primitive" myth, magic and cosmology, constituting in this sense a good example of "allochronic" discourse. Originating within the colonial politics and ideology of the 1960s, and contested by younger generations of sculptors from the 1990s onwards, this discourse was, paradoxically, appropriated by the cultural politics of "indigenisation" during the early period of the post-independence Zimbabwean State as part of its national identity and heritage.